That’s it. That’s all there is to it. I must – and I mean, I must – finish the Secret Garden hummingbirds. They’re fluttering around in my head, every time I try to move forward on any other project. In fact, it has more feathers than that – but not many more! The last time we visited the project was way back in mid-January. The little tail section was finished and one wing feather was stitched. I stitched one tiny fix on it since then. Nothing else. It’s been covered up, waiting. 1. Full Marathon. 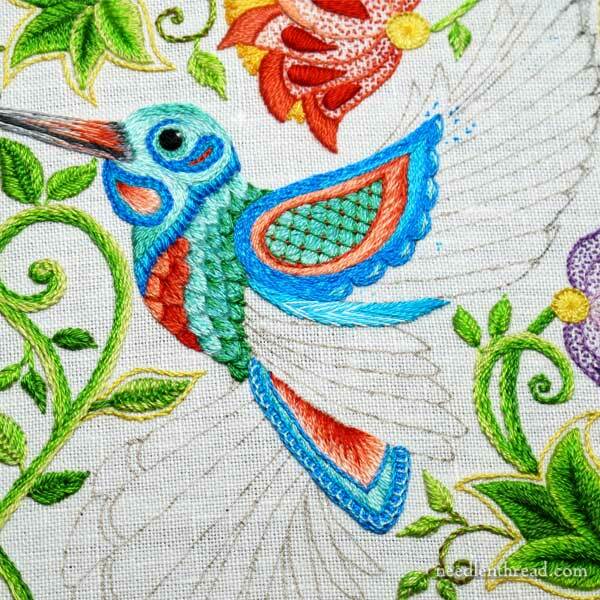 That is, I could only embroider on the hummingbirds, for as many hours a day as possible, at a frenzied pace, for as many days as it takes to get it finished. There’s certainly a lot to be said for this approach. It gets a project finished, faster. It eliminates all other obligations, as far as embroidery goes. It requires the mind to focus on one goal and push towards it, while shutting everything else (embroidery-wise) out. The downside: I’ve got some pressing things going on at the moment that I can’t abandon even for just a few days. Besides, this frenzied, focused approach can take a lot of the pleasure away, that should be a part of every embroidery project. 2. Half-Marathon. I could take the half-marathon approach and spend a good amount of time on it each day. Maybe not push through it with a frenzied approach, but just push through it in large chunks of time. There’s something to say for this approach, too. It would get the project finished, faster than some approaches. But it leaves more time in the day for other goals, other projects. Unfortunately, it too often slips into Approach #3, because it lacks absolute focus. 3. Always-Present-but-Never-Seen. I could tell myself I’ll work on it when I can, when other projects aren’t as pressing, leaving it up where I can see it, where it’s accessible, and tell myself I’ll “get to it” every day. This is the approach I’ve been taking. There’s not a whole lot to say for this approach. You can see how far it’s gotten me! In fact, it may be there, but I don’t really see it anymore. I ignore it, because I have other things I’ve been focusing on. The positive side of this approach is that there’s absolutely no pressure, and I can talk myself out of feeling guilty about not getting to it, because I keep telling myself I’ll get to it – after all, it’s up and waiting. The negative is obvious: I don’t get to it. I just ignore it. 4. Pack it Up and Forget It. I could take the absolute position that I won’t work on it until I finish more pressing matters, and I could pack it away out of sight. There’s something to say for this approach. It is, after all, a decision. It alleviates pressure. But, for me, it also tends to lead to a forever-unfinished-forgotten-in-the-closet embroidery project. That just isn’t an option for the hummingbirds. 5. Break It Up and Tackle It. I could break the project up into some very small segments and set small stitching goals for every day, making the project a priority (and a kind of challenge) to meet each day’s small stitching goal, while keeping it manageable within my current schedule. The positive: it ensures progress every day, albeit a very small bit of progress. It prioritizes the project, but not so much that I can’t get other things done. The negative: it asserts a certain amount of pressure, because it requires a commitment. But it’s not an undoable commitment. The latter – #5 – is the approach I’ve decided to take. The difference in this approach and using embroidery as a “carrot” or reward, is that I’ve now made the daily hummingbird goal part of my work for the day and it’s rotated into my daily To Do list. My goal: a feather a day, Monday through Friday. One feather. Five days a week. There are 30 feathers left on the hummingbird. Some are larger. Some are smaller. No matter what the size of the feather, each day, I will stitch One Feather. On particularly busy days, I can select a small feather. On days when I know I have more time to juggle with, I’ll take a big feather. But every day, Monday through Friday, I will stitch One Feather. I’ll keep you updated. As I progress, I’ll let you know how it’s going – whether I succeed or flop! If you have any unfinished project that’s hanging over your head, why not join me in the challenge? Divide your project into small, daily-doable goals, and let’s work through them together. You might adjust your goals to three days a week or even just one or two days a week – it all depends on your schedule. But the point is: if you have a project you feel obliged to finish, but you’re just not getting it done, break it down into little segments that are reasonably doable for you, and make a commitment to a particular schedule of accomplishing each segment. If you want to join me – even in spirit – feel free! I’ll keep you posted on how I’m going. You can keep me posted on your progress, too. Any thoughts, suggestions, comments? Feel free to chime in below! Ah, I have a name for your method 5, Mary. I call it “elephant cooking” – it comes from a old riddle. “Q: How do you cook an elephant? A: Chop it into pieces and fry the pieces.” It’s a good method for many large problems: breaking the problem into manageable bits and work steadily through the bits. I do like your idea of matching the feather of the day to the amount of time you’ll have – that should make the plan a lot easier to stick to. Sounds quite reasonable Mary. I’d join you, but I’m currently working only on one embroidery project. I hope to learn much from that one and don’t feel comfortable proceeding with other projects until I know what problems I run into with this one, including taking it off the Evertites and getting it ready for framing. However, there are many other things (less enjoyable) that I’ve been putting off, and the commitment of doing at least one such thing a day is a good one. I’m glad you’re finishing the hummingbirds because I’ve followed along with this one closely and want to see how it all turns out. I think it was a longer and more complicated project than even you realized at the beginning. Good luck Mary. It’s like you are in my livingroom this morning! I am looking at a project that needs to be finished in 3 weeks….must get it done! So I’m on the computer instead….Uggg! I am glad that 3 and 4 aren’t viable options for you on the Hummingbirds. You are far too far along to give it up or leave it to languish while out in the open. So, option 5 is a good one for you. I will join you in Option 5 for a few of my projects that have fallen into your category 3 for way too long (one of them 16 years too long but I took it out to work on it after New Year’s Day this year). So, hopefully, we will both stick to this resolution and finish up these projects. Awesome! Love the way you listed all the choices and then picked one. I will TRY to take you up on the challenge. it has been at least three months since I sat down and did any embroidery, but my last project is sitting there, waiting for me and staring at me. Sometimes life happens and you don’t always get to the fun relaxing stuff. But I shall try, Obi Wan, I shall try. I like the feather a day approach. I am trying to apply it to a gorgeous wool and mohair afghan with 9 cables running the length of blanket. It was a wedding gift for my son and daughter-in-law. I spent over $500.00 on the yarn. We are going on their 2nd anniversary in late July and I am determined to finish it by then. I have let all sorts of smaller finishable projects get in the way – baby sweaters, gloves a crewel vintage owl sampler. It has laid on the couch for almost 2 years, scolding me each time I pick something else up. I am taking Mary’s challenge – 6 rows a day, without fail. It could be 3 in the morning and 3 at night but 5 a day. There are 12 rows in the repeat pattern. There. I have written it and hope it to be so. But I may work a bit on my 2nd vintage owl sampler in between…. Good Morning, Ms. Corbet. All I can say is that whatever approach you’ve chosen, you MUST finish this project! It’s too stunningly gorgeous and wonderful to turn into a UFO. I don’t mean to pile on pressure, but it’s a sublime piece that I am so in love with, that the thought of it not being finished makes me want to sob. Well said, Kristina Marie! I, too, love this project. It brightens my day every time I see it. Every bit of progress is a delight. I’m looking forward to seeing the finished piece. Thanks Mary, this is such an encouragement that applies to so many things, not just embroidery! i am currently working on a huge project from the crewel twists book. at first i thought it would take forever to finish and almost felt overwhelming. the good news is the way the book breaks each section down into small parts. i focus on one small section at a time. there are over 40 colors in this project. the first day i read the directions and thread all the needles (buying a package of 16 #8 needles was a good idea) in the different colors. i simply pin the threaded needles to a piece of paper and write the color number on the page. i also research how to work a stitch if it is new to me. on the next day i am all ready to stitch the area and it goes fast and easy because of all the prep work. i cannot tell you enough how much i enjoy your daily blog. thanks again for the information and the inspiration! I’ll join you Mary! Not in stitching but in organizing/cleaning….sigh….of my sewing room…yuk!!! It has always been an issue but now it is reaching critical mass!! I have absolutely NO ROOM to actually do any work. There is fabric and UFO’s on four different tables. I’m also determined to throw out things that I don’t use and all those odd pieces of fabric (well maybe not throw them out, after all I might need that six inch square of pre-quilted fabric that might become a pocket on another project someday. just get them all in one place, preferably in a box) I’ve also committed an old PC that runs with XP to going to my sewing room but alack, there is no room for it. I use the programs on this PC A LOT and really for nothing else except those obsolete programs (photo editor; my ultimate box for embroidery machine designs, etc., except a backup and that doesn’t even apply any more because it won’t function on the internet due to outdated software (don’t ya just love Microsoft?) Anyway, I’m going to commit to 15 mins per day. No other work will be accomplished in my sewing room until I get the PC downstairs and some table top free to work on. I’m going to set a memo on my phone for the same time every day to REMIND me that it needs doing. so I wish you luck and good stitching and wish myself the ability to actually accomplish my goals….LOL! Good luck, Sharyn! I was thinking of tackling my workroom in sections this week and re-organizing, especially while the weather is good. I really want to re-organize everything inside my cabinets. But I fear this isn’t going to be the week, after all. I may do a workroom clean-up / organization challenge in a couple weeks, once I finish a few pressing things! ha! Tame the craft room is one of my UFOs, too! Here’s a hint to help you let go of some of those treasures you think you probably won’t use, but can’t throw away and they don’t make sense to put in Goodwill: find an Upcycle creative reuse center. These are popping up in many areas and collect all sorts of crafty things, from corks to fabric scraps to old calendars. Most use the donations to supply arts classes in the community. As an example, here’s the one I donate to: http://www.upcyclecrc.org. They are a godsend in so many ways. Good luck! I tried setting myself a small personal project goal while working on a time sensitive project and I utterly failed. I had decided to do 10 stitches a day on my personal project, and the rest of the day work on the time sensitive one. I ended up never picking up my project so I tried to modify my goal to only picking it up on sunday evening. That worked ‘better’ but still wasn’t ideal. After the time sensitive project got finished, I finished my personal project in a week. I’m waiting for the entire Hummingbird piece to be done before I start mine, so I can have all the floss to do mine with and don’t have to keep going back and forth to the store. Please, please, pretty please finish it–like Sue Jones said, embroider it as if you were eating an elelphant—one bite (feather) at a time. That being said—I won’t share how many “unfinished, hidden” projects I have,that would be telling. Doing a bit a day works, but makes it sound like a CHORE. Packing the piece away for 6 weeks can be beneficial. Out of sight, out of mind. When you open up the project again you may have insights as to how to do it quickly and with enthusiasm. It is like a book that is on the side of the bed and you work on it when you have nothing else to do. I have a problem that my right shoulder starts to ache so everything I do is 1/2 an hour to an hour. I love the piece you are working on and I am excited to see the completed work. I have tried to work on a project everyday for x amount of time. It seems once I get started I don’t want to quite. Go figure! So other things go to the way side. I have also tried on larger things to take one project a month. When the month is up I put it away. If I finish a project I start on next months. I hope this makes sense. Thanks Mary for all your time you invest! Oh this is such a wonderful idea–and yes, while it does put a bit of pressure on, it’s necessary pressure, methinks, for projects that have been sitting around waiting for a bit of attention. What I’d like to know: when do you sleep? I tend to be an out of sight, out of mind type of person but I can eat an elephant one bite at a time so generally I’ll set mini goals as little as deciding on a thread or stitch. Well if I get that far, I’ll go a little farther and the day or week sees progress. I will join you. I have a project that I want done by May. It has a lot of tedium at the current point, so I work on it at least 10 minutes a day or one thread length. Most days I work more, some days not at all, but I am making progress. I think option 5 is a good idea to do a little each day so that you can attend to other pressing items on your agenda and each feather you achieve you can say only so many to do and soon there will be none, a bit like the song ten green bottles only in this case there are thirty. I love the colours on the humming bird on the photos above they really blend in well. I have only one project at the moment which is keeping me soooooooo busy, so back to my sewing. Thanks for sharing your options on approaching embroidery projects and for your opinions on them. Good luck with Monday feather. I like your chosen method, and am eager to see your progress on the hummingbirds. I’ll try your method too. In my case I will commit to spending a minimum of 1/2 hour per day on my current cross stitch project. This commitment will last until end of March. If I finish it(likely since it is a small project and not far from being done), I will spend the same amount of time on a yet to be determined WIP. Is that one thread. I have definitely finished more with the 1 thread a day – less intimidating to start and I usually do more – but at least I have done something everyday on the project. With my knitting – it is the one row. Darcy, what a wonderful suggestion. I have a Christmas stocking that I have absolutely no enthusiasm to work on for some reason, yet it has to get done. I think i’ll try your one thread idea. Okay Mary, I’m in! Actually choosing something specific is certainly better than just promising myself to ‘try to do some every day’. Because that just isn’t working. I have a BAP, the Holland Mandala by Chatelaine. I have been working on it for quite a few years and it needs to get finished! This might be a big help. Thank you, Mary, for describing your process in determining how you will finish the hummingbirds. It is so logical, but it helps me to make some decisions in my work, too. I am SO glad you are finishing the hummingbirds and not putting them out of sight, and your choice of how is so great – it will continue to be a pleasure and not a drag! They are so lovely! It has been such a delight to see them pop up from time to time. Number 5 is absolutely the best approach to finishing a project. I currently have half a dozen projects that I try to rotate weekly unless I get thoroughly absorbed in getting something finished and am close to doing that. It works well also when you are in a boring part of a project like large areas of the same color and the same stitch. Or, as a friend of mine who sews beautifully embroidered Palestinian dresses – “A thread a day is all it takes.” She doesn’t finish a lot of them, but she finishes them at a steady pace. #5 I work this way a lot with lot’s of things. I call it Swiss Cheesing. Taking small bites out of projects until they are finished. I do it with embroidery, paperwork, doll making cleaning etc..when I feel overwhelmed and way to many things on my list this is the path I take, Good Luck..I will be right there with you with my list of projects. This is such a great idea – thanks for the reminder. It can apply to so many things, too. I liked the reference Sue Jones made to “cooking an elephant”. I have so many of these projects – I think I better go get started :-). A feather a day sounds like a version of my 1-a-month approach to finishing UFOs. Trying to do ONLY those pieces that are waiting to be finished is really onerous You don’t want to devote yourself to them–so boring that it is onerous–and you’ve told yourself you won’t do (you name it) till that project is finished. So you get nothing done. But if you break it up–30 feathers in 30 days–you’ve got the 1-a-month done. AND you get to start new things, or take a walk, or clear your sewing room, to boot. Great! The break-it-down-to-small-bites idea applies to every project that has been staring–glaring?–at you. Sorting files, clearing out stored boxes, not just UFOs. I am using the 1-a-day method on my Cathedral Window begun decades ago. I realized I had too few blocks so I cut out many more. I am now “staining” a minimum of one 4-block a day. Slow progress–but progress. Maybe another year will see it finished. Knock wood. Good luck to everyone in using this approach to move along on a particularly intractable job until finishing is inevitable. Mary, I usually find when I can’t get back to a project that there is something I don’t like about it, something that just isn’t setting right with me. If I can identify and correct that I am off and running again. I might stop, if I were you, and try to identify something that is troubling you about the piece. If you can’t find it, maybe you have just lost interest and need to plow ahead to finish it. I when I start with an embroidery project, I do just that one and finish before I start the next one. I once tried before to do two simultaneously but ended up just doing the one. I have just finished my Knysna Loerie (Turaco) and started a panel from Di van Niekerk. I bought it over 13 years ago and I decided it is time to start and finish it, like now. The panel consists of 12 segments with different flowers in each segment. As most of Di’s designs, it consists ribbon embroidery, stump work and various embroidery stitches. I already started on the stump work and I think it is going to be fun. I also set myself a goal the try and finishing one segment per week :). Well I will try and in another 12 weeks I will be finished, um hopefully. Ok let the games begin 🙂 Best of luck to us all. See you at the finish line. C) I have to finish updating the guest room, which has waited through the Christmas season to get more progress done on it (ah, the joy of a house in updates!). But even then I have to organize the garage/ carpentry workspace because my tools and assorted junk in there are threatening to make the place unusable. I always laugh at myself because I consistently over-schedule my time and ability. I keep wanting to get to a point where I stitch 2-3 hours every night – maybe in a few years…. I will add a helpful tip to your plan here, Mary! Last week my Texas Star schedule suffered because I was doing something very similar for another project. So my advice is to make this the only project on the go with these particular materials, colours, and/or stitches. Then you will be less likely to burn out. I have to decide now if I will change my schedule, or try to catch up! It should be possible to catch up, but I can feel it dropping down the priority queue even as I write this… Well, I guess I don’t have to get completely caught up again right away! Oy, yes, I’ve felt that burn-out when doing several projects that are very similar in theme, color, etc. Last year I finished three Lone Star quilts and (for now)have zero interest in working on the last one that’s ready for quilting! One feather a day might be too much. 3X/week?? I was desperately searching for employment and in order to diminish my anxiety, I started a needlepoint project in the evenings, when I was no longer paving the pavement. All of a sudden I was hired and the needlepoint got put away because I had to relocate. In the process of moving I misplaced,lost the instructions, so there it sits. Any comments as to what I can do with it? it a pulled thread in some parts, but different embroidery at other areas. Dear Velia, your story reminds me of working away from home last year and living out of a suitcase. While away, I met a lovely group of ladies who shared their beautiful quilting fabrics with me. So I made my own friendship crazy patchwork and it’s now hanging up at home. What I’m suggesting you might like to do with your work – if you can bring yourself to do it – is to have another look at it and see if you can bring it to life and make it your very own by adding pieces of beautiful fabric to it and stitching to reflect your journey from looking for work, to beginning your embroidery and to now being employed. Just want you to know that I can totally relate to your procrastination areas! I don’t do beautiful work like you do, but try and add love when I do something in embroidery. I have followed you now for a few months, and totally LOVE all that you do. You inspire me and make me laugh, along with feeling your frustrations as I feel. Thank you Mary, and keep up the wonderful work. I should like to say that great minds think alike, but I am no great mind. At the beginning of 1/15, I set myself the goal of finishing the wall hanging I have been making for my soon to be 33 year old son, by the end of 2015. I am ashamed to admit I began working on this in 2011 (head hanging in shame). I work on it 1/2 hour each evening. This may seem tiny for most, but for me it is a giant step. Here’s to baby steps!!!! Thank you for all the encouragement and postive ideas you share. I appreciate you. My project is so delayed because Grand Daughter saw the incomplete table cover. She wants shiny thread in the center. It is like working with wire. In addition, this cloth was designed from iron on transfers. They ironed on too dark. I cannot find a way to remove the print. Guardian Angel that you might be…I’d appreciate some advice so I can continue with this five year project? Once I solve these problems I will choose Full Marathon. I’m growing older. Ah, Joan! Metallic threads are notoriously a pain. They’re tough to work with! I’ve only found a few that give consistently good results and are easier on the stitcher than most – one is Au Ver a Soie’s metallic braid and the other is DMC Diamant. I don’t know where you can find the AVS braid, but you can get Diamant through Needle in a Haystack. The Diamant is very fine indeed: the AVS braid is heavier – if you look at the first photo in this blog post: https://www.needlenthread.com/2014/08/stitch-fun-here-it-is.html you’ll get an idea of how heavy the metallic braid from Au Ver a Soie is. The line there is about 1/4″ wide. Hope that helps a bit! What a great challenge!! Good luck to all of us. For me, I’m going to designate 30 minutes a day to stitching or knitting. I think I’ve stalled because I have so many choices and get overwhelmed. Today I’ll count my many blessings, make a decision, and get busy. Thanks, Mary, you are truly an inspiration! Hi Mary, I agree with your approach as I did the same thing to finish my hummingbirds and flowers here. 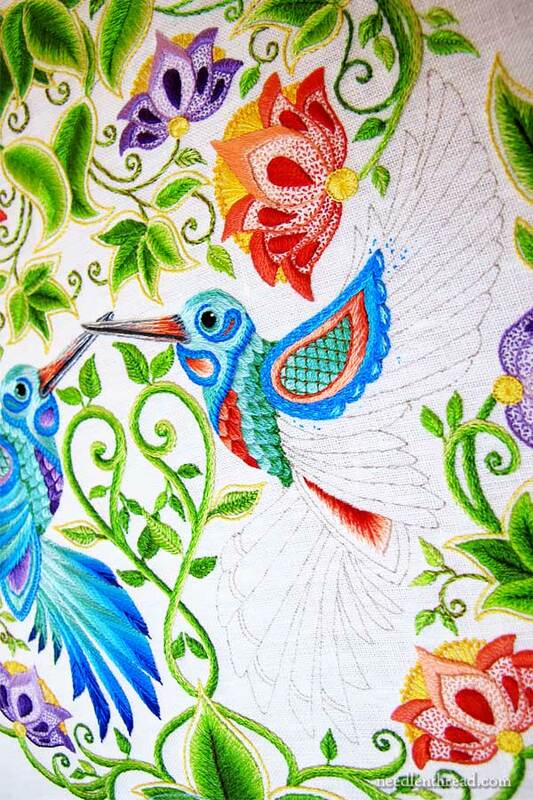 Now I am concentrating on a design by Tanja Berlin called Black work Lovebirds. I am also working on a Martina Weber Chatelaine design called Butterfly Lace Mandela. I intend to finish these two projects before going on to anything else. I follow something of the same method, especially when I have many things going at once. For example, at the present time, I have two quilts, two embroideries, a leather handbag, and three book restorations in the queue. The last week has basically been: spend the morning on the books, quilt for an hour, embroider for an hour, sew a row of quilt blocks, sew part of the bag, embroider project #2 for an hour, and so on. Setting any of these projects aside while I finish one of them would actually be an inefficient use of time! That is such a good idea that I’m going to apply it to some non-embroidery projects which have been hanging over my head for too long. In fact, I haven’t picked up a needle in ages because I feel obligated to finish these other projects before I begin anything else. I’ll look forward to your progress. #5 approach sounds great to me. It will work for many projects – including cleaning, organizing, each different art or needlework project. You will never get bored or tired of the same old thing over and over if you switch it out every hour or two. I’m going to make my schedule right now. Thanks for the motivation. Ha, you sound just like me! We’re sharing a real wavelength here. I’m just glad to know that I’m not the only one with stallerific tendencies. I applaud your methods, especially for the end of a project jet lag. Just one stitch in front of the other, and its another feather down, down, down. Besides its sure to keep all us anx’sty coat-tailers down near the hem where we belong instead of crawling up your back causing all measure of uncomfortabilities. I predict at some point you’re going to surprise us with a flash finish. That’s right Mary, keep ’em guessing! You know what they say about the bluebird of happiness, early bird gets the worm! You’re a rock star! Your work is glorious. I hope you pick the option that gives you the most pleasure. Approach 5 is how I work, too. The full marathon only works when the end is close enough to turn it into a sprint. A feather a day… what a great idea. I have a children’s alphabet design from the 1950s. There are 12 panels and I’m committing to working on one piece of the first (a,b,c)panel each day. When that is finished I’ll begin on panel 2 and so forth. Thanks so much for the great idea and guidance!! I am one of those people than connot move on to another project before I finish the one I am doing, similar to when I read a book I cannot start one book and then put it down and start another one. My project started two years ago I decided to make a stumpwork picture of my daughters favourite horse and dog, the scene is taking place in Arizona were she use to work on a holiday Dude Ranch. I have most of the picture finished but cannot get the grass and sand right so I keep undoing that area and starting again. I have lost count of the times I have unpicked and restarted. Either the stitching was wrong or the colours were wrong. So I am going to take your advice and try a feather a day and see how far I get. I have so many projects backed up it will be pleasure to start something new…..Thankyou for the inspiration……. Mary, I am sure you will achieve your aim. I am so looking forward to seeing the Secret Garden project finished. I have 2 and a bit flowers left to finish then onto stitching the birds, which I am feeling rather nervous about! The hummingbirds are my main focus right now and I work on them during the day when time permits, then at night I am trying to finish a cross stitch I started about 25 years ago when my children were very small. I have started a gold work piece but thought I shouldn’t continue until the humming birds are finished. Slow and steady gets there in the end! What you’ve already accomplished on the hummingbird project is great stuff. Good on you. “Little by little, so grows the vine, little by little….” Sure and steady wins the race eh. I find setting small stitching goals is a good approach for me and that is how I am currently progressing a big project. I set a time goal. My aim is for an hour a day but I rarely achieve that during the week but as long as I so a little bit every day I know I am one small step closer to finishing. I am loving the project and would happily spend longer on it, my issue is lack of time. A feather a day, that’s do-able. Good luck. Thanks Mary for the great points. I have loved each of your posts on this project and by this January, I had only done the vines and small leaves. When you finished the first hummingbird I was so excited to get going on mine. Once I finished the large leaves and thought about how I would do my flowers, I checked the site of what others had done. They were really beautiful, but I had grown so in love with your colour choice and when you chose those blues for the hummingbirds I was overwhelmed by the overall effect, I knew I had to follow your choice or I would be disappointed. From there I used the ‘marathon’ approach and worked feverishly (an approach I love when I start to see results) and finished the whole project a couple of weeks ago! I am so happy with the result and cannot thank you enough for your generosity in sharing your wonderful talents!! chiming in again Mary. Day one was an abysmal failure due to my waiting for the UPS man to come. about a month ago I finally upgraded my XP software to Windows 7. What a disaster. have been going through computer h*ll! after dealing with the disaster the computer has become I finally called a spade a shovel and said, this isn’t working. long story short, for whatever reason the upgrade destroyed my PC. it now works ONLY when it wants to. so I trotted down to staples on Friday and ordered a new PC. it was to be delivered yesterday so I was in wait mode. I can’t work in my sewing room and be able to answer the door in a reasonable amount of time. anyway, PC came and I have to get an anti virus program before I set up the new pc then there is all the software and periferals to add to it, so I don’t know if i’ll get to the sewing room again today…..BUT i’ll keep trying. Oh dear. Sounds dreadful, Sharyn! Better luck with the new one!! Mary, I read your newsletter every morning before work. I am new to embroidery and I really am interested. I get overwhelmed by projects and can become irritable which is so far from my goal with a hobby. So like you I am learning to tackle a small goal at a time. I try to apply this to my work and other tasks as well. It works great for me. Thank you for your wonderful website. Hand stitching is a fabulous way to express myself. I finished pillowcases , probably because I needed them . Good Morning, What I have found that works for me. Is I pick my oldest UFO’s and evaluate the situation. Do I still want to do them and so on, then I pick four that need to get completed. I cannot shop for anything new until they are done and set a time frame to have them done and just work on one at a time until those for are done. Yes, I hate to admit it I have more than four to complete. Miss Mary, are you a mind reader? Are you able to see into the past and future of your subscribers? I believe you can and do! I am the one with the unfinished 40 year old project. I have not touched that middle aged orphan in several days; are you watching me? Does my project msg you at midnight with tales of neglect? I think that may be the case! So today I will commit to the ‘Mary Plan of Completion’ to satisfy both my project’s pleas , my conscience, and to release you from one minor task of monitoring the put-off ers. I agree that approach five strikes the right balance between progress on a piece, pleasure while doing it, and pressure to get it done. It reminds me of Gay Ann Rodgers suggestion for needlepoint projects which are languishing; Just do 12 stitches a day. It works so well. You are encouraged by seeing progress everyday but you are never overwhelmed or bored by the project. Dear Mary,Thank you so much for this article. No more guilt, only smiles, #5 is for me. Now that I am retired, you would think I would spend much of my day with needle in hand, but I find I have less time now than ever before.